This is the main website for the Traralgon & District Historical Society. 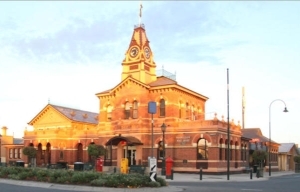 Traralgon is a major country city in Gippsland in the state of Victoria in Australia. It is situated about 160km east of the state capital, Melbourne. Our main localities of interest are Traralgon, Boola Boola, Callignee, Carrajung, Flynn, Gormandale, Koornalla, Le Roy, Loy Yang, Toongabbie, Tyers, Walhalla and Willung. Open days: Last Sunday of each month 2pm till 4pm except December and Public Holidays. Rooms can also be opened by appointment. 10 April @ 7:30 p.m. - Monthly meeting replaced by the trip to Sale described below. 13 April @ 10 a.m. - Display at Traralgon Craft Market in Kay Street. Come and talk ! 14 April - Members trip to Sale. Tickets on the boat cruise down to the Swing Bridge are booked out, but you are welcome to join us for a counter lunch at the Criterion Hotel at 12:30. After the lunch you can join a tour of the powder magazine with noted historian Peter Synan. 28 April @ 2:00 - 4:0 - Open Day at the rooms at the Kath Teychenne Centre. Visitors very welcome. 12 May @ 10 a.m. - Display at Traralgon Craft Market in Kay Street. Come and talk ! 14 May @ 7:30 p.m. - Monthly meeting at the rooms. Guest speaker will be Peter Butcher, whose topic is James Cook's Story in Stamps. 26 May @ 2:00 - 4:0 - Open Day at the rooms at the Kath Teychenne Centre. Visitors very welcome. 9 June @ 10 a.m. - Display at Traralgon Craft Market in Kay Street. Come and talk ! 11 June @ 7:30 p.m. - Monthly meeting at the rooms. Guest speaker will be Barbara Johnson, whose topic is Jean McNaughton's reflections. 30 June @ 2:00 - 4:0 - Open Day at the rooms at the Kath Teychenne Centre. Visitors very welcome. 9 July @ 7:30 p.m. - Monthly meeting at the rooms. Guest speaker will be Debbie Leatham (CGS and Gippsland and Region Studies Collection; Fed. Uni). 13 July @ 10 a.m. - Display at Traralgon Craft Market in Kay Street. Come and talk ! 28 July @ 2:00 - 4:0 - Open Day at the rooms at the Kath Teychenne Centre. Visitors very welcome. 11 August @ 10 a.m. - Display at Traralgon Craft Market in Kay Street. Come and talk ! 13 August @ 7:30 p.m. - Monthly meeting at the rooms. Members Night. 25 August @ 2:00 - 4:0 - Open Day at the rooms at the Kath Teychenne Centre. Visitors very welcome.